I n the EU project STREAMLINE the fuel effi ciency of a chemical tanker was improved by optimizing the hull form and propeller. To this end, MARIN used its hull optimization program PARNASSOS EXPLORER and a newly developed propeller op- timizer. The hull form itself was opti- mized for low resistance and for having a wake fi eld as rotationally symmetric as possible, while simultaneously main- taining the displacement and suffi cient space for the engine room. Meanwhile, the propeller was required to deliver the right thrust at the same ship speed and engine rate of revolutions. Normally, the propeller designer starts when the hull lines have been set and the main propeller parameters have been de- cided upon. Series, plus hands-on experience and rules of thumb to estimate the effect of propeller-hull interaction. For instance, the sector knows that the best propeller diameter in a wake fi eld is smaller than given by the propeller series. Once the main dimensions are selected, the de- signer continues to mold the geometry until the effi ciency is high and the hin- drance from cavitation is as low as pos- sible. This is a time-consuming process that is particularly ill-suited to fi nding the best propeller when considering 500 hull form variations can be generated, as was the case here. It was clear that a tool that can quickly cover a wide range of design choices and return ballpark fi g- ures for effi ciency, including the propel- ler-hull interaction effects, was required. When a large number of propeller ge- ometries are to be generated, the range should be as large as possible but cer- tainly not by including every imaginable shape. Therefore, the propeller blade geome- try was built up from radial distributions for the pitch, chord length, skew, rake, camber and thickness, and these distri- butions were described by newly devel- oped parametric functions. 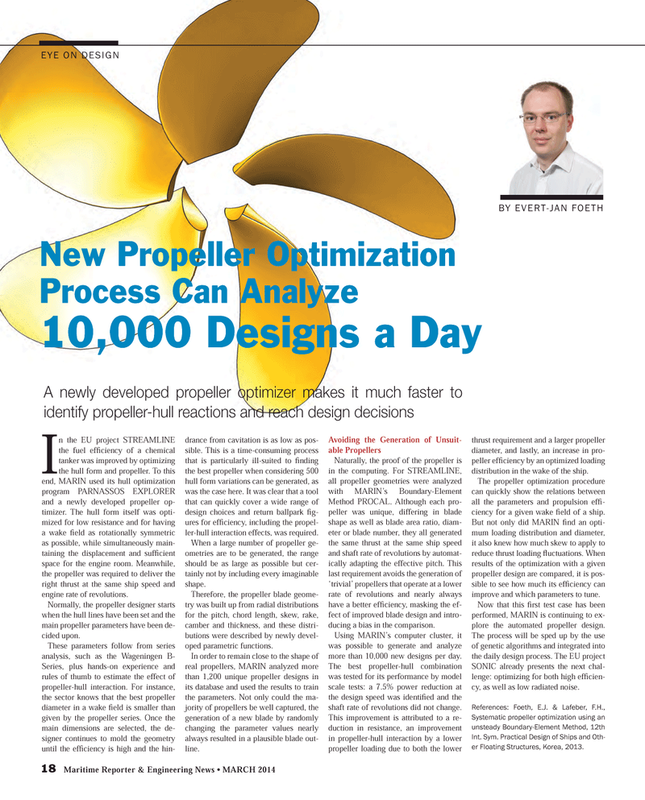 In order to remain close to the shape of real propellers, MARIN analyzed more than 1,200 unique propeller designs in its database and used the results to train the parameters. Not only could the ma- jority of propellers be well captured, the generation of a new blade by randomly changing the parameter values nearly always resulted in a plausible blade out- line. Method PROCAL. Although each pro- peller was unique, differing in blade shape as well as blade area ratio, diam- eter or blade number, they all generated the same thrust at the same ship speed and shaft rate of revolutions by automat- ically adapting the effective pitch. This last requirement avoids the generation of ‘trivial’ propellers that operate at a lower rate of revolutions and nearly always have a better effi ciency, masking the ef- fect of improved blade design and intro- ducing a bias in the comparison. Using MARIN’s computer cluster, it was possible to generate and analyze more than 10,000 new designs per day. The best propeller-hull combination was tested for its performance by model scale tests: a 7.5% power reduction at the design speed was identifi ed and the shaft rate of revolutions did not change. This improvement is attributed to a re- duction in resistance, an improvement in propeller-hull interaction by a lower propeller loading due to both the lower thrust requirement and a larger propeller diameter, and lastly, an increase in pro- peller effi ciency by an optimized loading distribution in the wake of the ship. The propeller optimization procedure can quickly show the relations between all the parameters and propulsion effi - ciency for a given wake fi eld of a ship. But not only did MARIN fi nd an opti- mum loading distribution and diameter, it also knew how much skew to apply to reduce thrust loading fl uctuations. When results of the optimization with a given propeller design are compared, it is pos- sible to see how much its effi ciency can improve and which parameters to tune. Now that this fi rst test case has been performed, MARIN is continuing to ex- plore the automated propeller design. SONIC already presents the next chal- lenge: optimizing for both high effi cien- cy, as well as low radiated noise. Int. Sym. Practical Design of Ships and Oth- er Floating Structures, Korea, 2013.